Happy birthday Gwen! 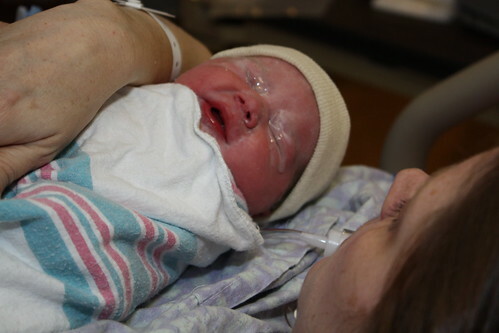 Our third daughter arrived on December 2, 2008 at 7:13 p.m., weighing 6 pounds 15 ounces. Thanks to the staff at New York Methodist Hospital, and our friend Jess, the midwife we wish we’d hired. Everyone is doing very well. If you want to reach Gwen, she can be reached via email. We’ve really been neglecting our updates of late. Life is busy as Karyn continues to slow down in the late stages of her pregnancy and we gear up for the arrival of our third daughter. Stay tuned for updates. Work for Dave is as exciting as ever. He has built an incredibly talented and profitable team at Fleishman-Hillard in New York that is set to triple its revenue over last year. Dave was also recently nominated for Canada’s Top 40 Under 40 for his work in digital PR over the last 15 years. We’re in the process of finalizing his submission which is due at the end of November. The competition is overwhelming but it’s been an honour for him to be nominated. Several people know that we made a family decision to move back to Toronto in the summer of 2009. There are several factors that influenced this move. We miss our family and old friends and want to be in closer proximity. Marley will be eligible to start French immersion in senior kindergarten in September 2009. Nicole’s early intervention services through New York State end when she turns three in July 2009. Our visas expire at the end of June 2009. When David informed Fleishman-Hillard of the decision, they said, “Don’t go anywhere.” The company has been so supportive of the decision and asked him to write a new job description that will see him retain some of his responsibilities in New York and bring his expertise to those in the company across Canada. He will also support colleagues around the world. Next year, he may visit Asia again and continues to connect with his peers across Europe. We feel really fortunate that he is employed by such an accommodating company and will continue to have global opportunities while we’re based back in Toronto. There is a fair bit we have on the books before making the move. We have hired the incredibly talented William Hudson at Post Architects to come up with some very exciting plans to put an extension on our house in Bloor West Village and optimize the living space to accommodate our growing family. We will also need to buy a car that will hold three car seats. After much research on our family car blog, we have narrowed the decision down to the Honda Odyssey and estimate that is is cheaper to buy the car in Canada than the U.S. It’s been quite the adventure. Minivan denial was a major early theme. We felt like the automotive manufacturers didn’t have a car that met the demands of our environmental conscience. They really don’t. It’s no wonder they’re teetering on the brink of collapse here in the U.S. They’ve been too slow to change and innovate. We also got severely turned off Volkswagen, our brand of preference since Dave bought “Emily Kar”, his 1972 VW Super Beetle, after college. Our decision does not come without regret. The move to New York has been phenomenal on so many levels. We love Park Slope, our Brooklyn niehgbourhood. Manhattan is magical. The entire city has so much to offer. We look forward to many return visits to stay connected with the great friends we’ve made and see the things we missed this time around. We still have a little more than seven months here, so we plan on making the most of it and hope for a last wave of visitors. Then we’ll start welcoming visitors in Canada! Is your organization social media friendly?